1971: A very different war is under way. The certainties of mid-century triumphalism are a distant, bitter memory, and Trenton's heyday as a factory town is long past. As the sign on the famous bridge says, "Trenton Makes, the World Takes." "A transgressive, barbed-wire sharp debut." "The honed-steel sentences on display here - vivid and sharp and scarily persuasive - are all the more harrowing for the vulnerability they manage to convey. Abe Kunstler is a singular protagonist, and Trenton Makes is a passionate and original first novel." "A novel cut from the same startling bolt of literary cloth used by writers like Djuna Barnes, William Faulkner or James Baldwin. Trenton Makes is about America now. Not the one that gropes at phantom meaning in gilded towers; the one filled with fierce, indelible human beings who squint out, unblinking at the raw, beautiful, wrecked world." 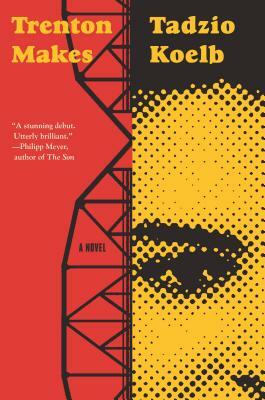 "Trenton Makes, Tadzio Koelb’s debut novel, is lyrical, brutal, unorthodox, and brilliantly unsettling. Koelb’s tale of Abe Kunstler’s journey across gender and through mid-century American time daringly eschews all simplistic feel-good tropes and truisms about gender. It unflinchingly narrates the brutality which underlies the daily performance of masculinity. His understanding and vision are those of a novelist who dares to push the boundaries of 21st century thought. Trenton Makesis a book which I can only hope the world is ready for." "This is the story of courage, of knife-edge need, of a battle to be oneself and stay oneself. Tadzio Koelb’s imagining of his unforgettable protagonist is as tough as it is compassionate; his prose seduces not just because it is stunning, but because it is uncompromising in its pursuit of one character’s mutilated truth."